A roundup of news articles featuring innovative wristband uses from around the world! This week begins Red Ribbon Week in the United States, a week-long alcohol, tobacco and other drug and violence prevention awareness campaign. Once school district is handing out more than 70,000 wristbands to promote a healthy lifestyle among its students and serve as a reminder to stay drug and alcohol-free. For more information about Red Ribbon Week, visit redribbon.org/. A consultant at the Royal Derby Hospital in the UK won a prestigious health care award for the hospital’s use of wristbands to indicate how much oxygen patients need. The color-coded system ensures patients are not administered too much oxygen, which can be dangerous for some conditions, and are an easy way for professionals to determine the correct amount. A mother made a wristband for her son to wear while swimming to inform staff and other swimmers that he was hearing-impaired. The wristband helps ensure safety and independence. It has worked so well that she is now producing more to sell to others. Wristbands work as waterproof, hypoallergenic medical alert bracelets to bring awareness for many conditions and in many environments. One high school is using wristbands to promote its second annual No Swear November. Students at Hazel Park High School in Hazel Park, Michigan will have the opportunity to take the pledge to use positive communication and think about the effect their words have on others, and contributions to “swear jars” will raise money for good causes. Churches, religious youth groups, and individuals have been using Reminderband wristbands to fundraise, build awareness, and share spiritual messages for years. We’re excited to offer a selection of predesigned religious bands on our website to represent some of the many religious bracelet possibilities Reminderband has to offer. Use our predesigned religious bracelets to order directly, get ideas, or as a jumping-off point for designing your own religious wristbands. You can also further customize the bands for specific references, names, artwork, colors, or symbols. Let us know if there are other predesigned ideas you’d like to see or if you have suggestions for how we can improve! Happy anniversary! 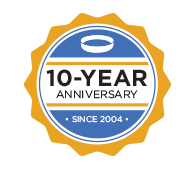 We’re celebrating our ten-year anniversary this year! Reminderband first started creating and selling custom silicone wristbands in 2004. It’s been a wild and wonderful journey, and we’d like to thank you for making it with us. To celebrate, we’re offering a special two-day sale. Enter promo code 10YR14 at checkout anytime today or tomorrow (October 14-15) for ten percent off your entire order (shipping excluded). Design your own wristband or check out our predesigned Military, School, Religious, Medical Alert, Cancer, or Awareness Bracelets. Thanks for ten fantastic years! In addition to our Military Wristbands page, Reminderband is proud to offer another predesigned selection of “Support Our Troops” and “Support Our Veterans” wristbands. These wristbands can be ordered from our site or used as a jumping-off point for further design and customization.